Celebrities are going to the dogs for Best Friends Animal Society's annual Strut Your Mutt Presented by BOBS from Skechers. 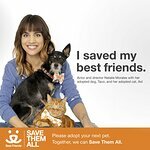 Zosia Mamet, Denise Richards, Michelle Beadle, Natalie Morales and Kristen Renton will each lead their own fundraising packs in both the Los Angeles and New York City community dog walks and festivals. Strut Your Mutt is a 12 city fundraising dog walk, 5K run, and festival that brings together rescue groups, shelters and individuals to celebrate the collective effort of saving the lives of shelter pets. Additionally, through a virtual Strut Your Mutt Challenge, supporters can raise money to help homeless pets in their own communities or for national programs that help to create sweeping changes for homeless pets everywhere. Six events have already been held, but check below for the remaining opportunities.